Red Sox No. 10 prospect Michael Kopech was suspended for 50 games on Thursday after testing positive for a performance-enhancing substance. The Office of the Commissioner of Baseball said Kopech received a 50-game suspension without pay after testing positive for Oxilofrine, a stimulant in violation of the Minor League Drug Prevention and Treatment Program. "I would like to start by apologizing to all of baseball, baseball fans, and specifically the Red Sox and Red Sox fan base. I respect the game as much, if not more than, anyone else. With that being said, I never have and never will intentionally cheat the game that has been so great to me. I haven't bought any supplements that aren't NSF certified for sport. Therefore, I know I have not bought a supplement containing this drug. I have never heard of Oxilofrine, honestly. Apparently, it is a drug that many people use for weight loss. I have been trying to gain weight since I signed with the Red Sox. I do understand this is also a stimulant. This drug would have no positive outcome for me and that's why I chose to appeal. I realized I didn't have much evidence to prove that I'm innocent, but I didn't have any understanding of how I could have failed a test. I respect the system and understand why they have to be so careful with the testing. I also understand why that means my suspension couldn't have been overturned without proper evidence. I have 50 games to get to work and better myself and as a ball player. Next season I'll be better than ever. Drug free." 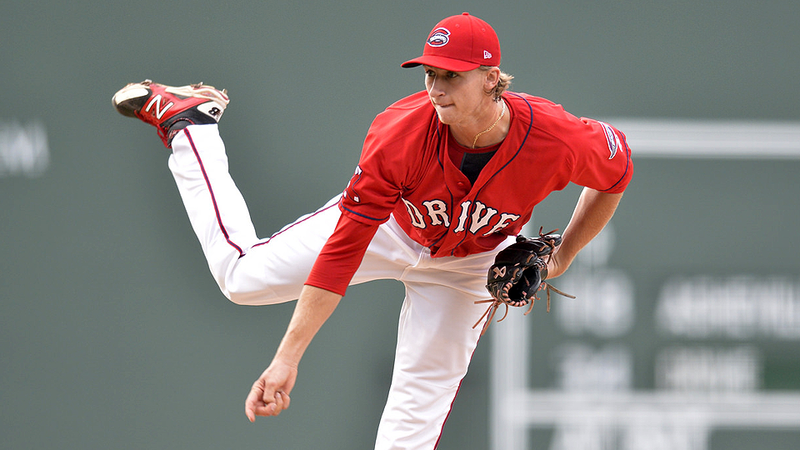 Kopech, 19, was the Red Sox's first-round pick in the 2014 Draft and received a $1.67 million signing bonus after Boston selected the 6-foot-3 right-hander with the No. 33 overall pick out of Mt. Pleasant High School in Texas. He was 4-5 with a 2.63 ERA and 70 strikeouts in 65 innings over 16 outings this season as a South Atlantic League All-Star with Class A Greenville. The right-hander, who had previously commited to the University of Arizona before signing, briefly debuted last summer with the Rookie-level Gulf Coast League Red Sox, where he struck out 16 batters in 13 2/3 innings over eight starts. He last pitched July 12. Oxilofrine is a stimulant of the amphetamine class that is intended to treat low blood pressure, but side effects can include increased adrenaline production, improved endurance, focus and heart rate. It also aids the body to oxygenate blood. For those who have normal blood pressure, the substance can cause high blood pressure and potentially lead to cardiac dysrhythmia and haemorrhagic stroke. Currently on the World Anti-Doping Agency's list of banned substances, it is considered a performance-enhancing drug. Elite sprinters Tyson Gay and Asafa Powell both tested positive for Oxilofrine in 2013 -- Gay had his 2012 Olympic 4x100m relay silver medal stripped after testing positive for the substance that May. Major League Baseball has issued 71 suspensions to 70 players this year for violations of the Minor League drug program.